Düsseldorf paid homage to its electronic music history with a three day event of lectures, discussions and live music. The ELECTRI_CITY_CONFERENCE celebrated the work of pioneers like KRAFTWERK, DAF, RIECHMANN, NEU! and LA DÜSSELDORF, as well as reflecting the city’s worldwide influence on bands such as NEW ORDER, THE HUMAN LEAGUE, DEPECHE MODE, CABARET VOLTAIRE, VISAGE and OMD. A year in the planning, organisers Rudi Esch and Carsten Siewert assembled an impressive line-up of artists, musicians and academics which read like a ‘Who’s Who?’ of electronic music. 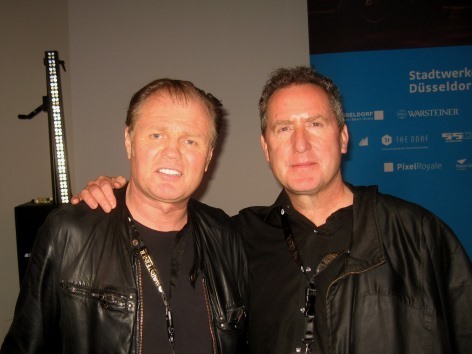 It included names such as Benge, Gabi Delgado, Ralf Dörper, Rusty Egan, Harald Grosskopf, Peter Hook, Stephen Mallinder, Andy McCluskey, Daniel Miller, Mark Reeder, Michael Rother and Martyn Ware. Also present was Dr Uwe Schütte, whose academic conference ‘Industrielle Volksmusik for the Twenty First Century – Kraftwerk & the Birth of Electronic Music in Germany’ at Aston University helped inspire the event. While there have been numerous books about Germany and in particular KRAFTWERK, few have been written by people who were actually there at the time. Esch’s own book ‘Electri_City: Elektronische Musik aus Düsseldorf’ was published in 2014 and provided a much needed eyewitness account. It fully related the Cold War tensions within Der Bundesrepublik that inspired many young Germans into pursuing adventures in art, music and cinema as a matter of self-expression and cultural identity. The book’s success in Germany provided much of the impetus and momentum to curate this lavish gathering of kindred spirits. The first of the special international guests taking part was Peter Hook who talked to Rob Keane about German influences on the UK’s post-punk scene and in particular, JOY DIVISION. It was Ian Curtis who first introduced the others to KRAFTWERK. After the charismatic vocalist’s passing, the surviving band members became NEW ORDER and as they became more electronic, they acquired five Prophet 5s costing £2000 each. KRAFTWERK had a look round Britannia Row but unimpressed with the old fashioned, faded grandeur of the studio, they cancelled the session. “I took that as quite a compliment” quipped the Salford Bass Viking playfully. Hooky also reminisced about how he was very impressed by fellow Mancunian Mark Reeder’s mastery of speaking German while on JOY DIVISION’s only visit to Berlin in 1980. Mark Reeder himself formed part of panel discussion on the German impact of the Düsseldorf Schule to give his ‘Englishman in Berlin’ point of view. As the man often credited with introducing Italo disco to NEW ORDER, Reeder’s recent film ‘B-Movie – Lust & Sound In West Berlin 1979-1989’ captured the spirit of the divided city and highlighted how a similar document about Düsseldorf would now be quite timely. The ELECTRI_CITY_CONFERENCE was not just about lectures and talks, but about live music too. Cologne’s EMOTIKON opened proceedings with some incongruous generic pop funk, so it was a welcome relief when HEAVEN 17 took to the stage at Zakk for the sold-out show. Headlining their first ever concert in the German art capital, HEAVEN 17 gave one of their now famous electronically focussed sets which also featured material that had spawned from THE HUMAN LEAGUE Mk1 when Martyn Ware was a member. Inviting him to join the band, Phil Oakey remembered how Ware turned up at his house with ‘Trans-Europe Express’ under his arm and told him “Look, we can do this!”. The song that best summed up the occasion was ‘I’m Your Money’, a synthetic train ride with multi-lingual business phrases that captured the essence of a European Union. 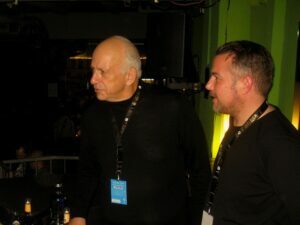 To follow a fine performance from HEAVEN 17, Daniel Miller’s aftershow DJ set reflected his influences and subsequent signings for Mute Records to conclude an excellent first day. With a packed second day, Friday’s numerous academic and theoretical proceedings were concluded with a Krautrock discussion in German by a panel of veteran musicians that included one-time ASHRA member Harald Grosskopf, Michael Rother from NEU! and WALLENSTEIN’s Jürgen Dollase. Whereas Germany has usually been associated with purer forms of electronic music, its kosmische outlook has influenced many rock and alternative bands too. However, Dollase’s continual ranting about the joys of LSD proved tiresome and was exemplary evidence to children as to why they shouldn’t do drugs! The panel was later opened up to questions from the audience so The Electricity Club took the opportunity to ask Michael Rother about his first three solo albums. Opening the second evening’s musical line-up, Dublin’s TINY MAGNETIC PETS have been championed by Rusty Egan and their appearance in Düsseldorf was their first in Europe. The trio’s main strength was their engaging lead singer Paula Gilmer, while Sean Quinn’s synth soloing was also enjoyable. But the occasional rattle of an acoustic drum kit was a distraction and the trio sounded much better when Eugene Somers took to exclusively electronic percussion. WRANGLER, fronted by Stephen Mallinder who had lectured earlier in the day, delivered a screeching set of dystopian vibes and cold wave mechanics, demonstrating how the Düsseldorf gene has mutated into marvellous pieces such as ‘Lava Land’. Mallinder’s drowning gargoyle vocal was particularly striking within the venue’s effective stereo panning capability. Incidentally, the trio’s incumbent synth collector extraordinaire Benge has recently relocated his MemeTune studio to rural South West of England, in an echo of Conny Plank’s legendary countryside complex which KRAFTWERK, NEU! and LA DÜSSELDORF all recorded in. Michael Rother delivered a career spanning set of his works including NEU! evergreens like ‘Hallogallo’, ‘Neuschnee’ and ‘Seeland’. There was also the welcome airing of material from his HARMONIA days too. Accompanied by Hans Lampe, formally of LA DÜSSELDORF, the drummer was unbelievably metronomic throughout, providing the hypnotic heartbeat to these much loved numbers. With assistance on bass and synth from a computer, the glorious symphony of ‘Karussell’ from ‘Flammende Herzen’ was a joy to behold. Watching enthusiastically in the crowd was OMD’s Andy McCluskey who told The Electricity Club that ‘Flammende Herzen’ was the most played album on his iPod! With another fine evening of live music over, proceedings then moved over to the famous club Dr Thompsons for the aftershow party featuring Rusty Egan. Originally a location for a factory making floor wax, Egan’s DJ set reflected electronic music’s past and present, much to the approval of both TINY MAGNETIC PETS and METROLAND whose tunes got an airing on the dancefloor. The conversation even turned to THIN LIZZY’s Phil Lynott who frequented the scene and recorded the synth friendly single ‘Yellow Pearl’ co-written with Midge Ure that featured Egan on drums. Also featuring Billy Currie, Egan confirmed that it was a VISAGE song in all but name. ‘Yellow Pearl’ was heavily influenced by LA DÜSSELDORF and was to later gain iconic status as the theme music to ‘Top of the Pops’ from 1981 to 1986, showing just how far reaching the influence of German electronic music had become. Wolfgang Flür’s now famous video messages on the world wide web have been a delight to many in electronic music circles and in his absence, a special broadcast was prepared by the former KRAFTWERK percussionist for the conference. Following on, Andy McCluskey and Rudi Esch presented some light hearted but music fan friendly banter in what was billed as The Electri_City Show. The Techno / Industrial panel in Deutsch fittingly included DAF’s Gabi Delgado and DIE KRUPPS’ Ralf Dörper as well as Ramon Zenker, the man behind FRAGMA. It would be fair to say that neither sub-genre could have had its roots in any country other than Germany. Delgado caused some amusement when he casually lit up a cigarette in the middle of the discussion, reinforcing the rebellious and confrontational aura of DAF. During the interlude, many went to take a look at the Monster Formant modular synthesizer, owned by local enthusiast Siegfried Brückner, which was being demonstrated in the foyer. Six years in the making and featuring a gobsmacking sixteen VCOs plus many other features too numerous to mention, it was an impressive sight that looked like one of those vintage telephone exchanges. To begin Saturday night’s live music proceedings were Zurich based combo LEN SANDER; their languid style of trip hop has become a favourite of Rusty Egan who also lists LONDON GRAMMAR among his current favourites. They provided a cerebral build before the appearance of two of the most impressive synthesizer duos in Europe at the moment. With the amount of equipment VILE ELECTRODES possess, they could fill Klingklang itself. Using their more streamlined European touring set-up, the Home Counties couple are now effectively adopted Germans having impressed enough during their tour of Germany supporting OMD in 2013 to land two Schallwelle Awards. Splendid new songs like ‘Pulsar Timing Array’ and ‘Stark White’ from the just released EP were evidence of their continuing progression. With a more minimalist set-up, METROLAND were the perfect act for the weekend to honour the artistic legacy of Düsseldorf. Their second long player ‘Triadic Ballet’ was a conceptual audio installation themed around das Staatliche Bauhaus. The perfect realisation of Walter Gropius’ theory of uniting art with technology, with a combination of crisp electronics and art school visuals, the Belgian duo gave a wonderful presentation that was appreciated by all those present including Andy McCluskey and Rusty Egan. Closing the event, escapist trio DELTA turned out to be the most disappointing of all the bands participating, their landfill indie totally at odds with the weekend’s ethos. Meanwhile Düsseldorf duo BAR fared much better, their synth laden dreampop augmented on occasion by singer Christina Irrgang’s use of a recorder. However, these two acts highlighted the lack of a clear headliner to finish the weekend on a true high. 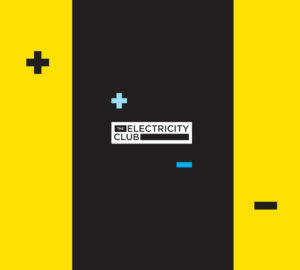 Overall though, the ELECTRI_CITY_CONFERENCE was fabulous weekend with representation from both sorcerers and apprentices of the Düsseldorf scene. With the English translation of the ’Electri_City_Musik_Aus_Düsseldorf’ book due in 2016, the story of what the city has contributed to the world can only spread further. French icon JEAN-MICHEL JARRE said recently: “Electronic music has a family, a legacy and a future…” and there was nothing more truer than over these three days by der Rhein. 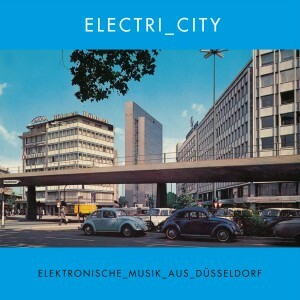 The ‘Electri_City – Elektronische_Musik_Aus_Düsseldorf’ compilation is released by Grönland Records.